It’s another Monday arriving again, but as the four day Easter weekend rolls ever closer, I find myself not minding. That, or the fact that weekends don’t exist in quite the same way when you’re in assignment season at university. I have been flirting with the idea of having more savoury breakfasts, although my heart still firmly lays with meals of the sweeter persuasion first thing. 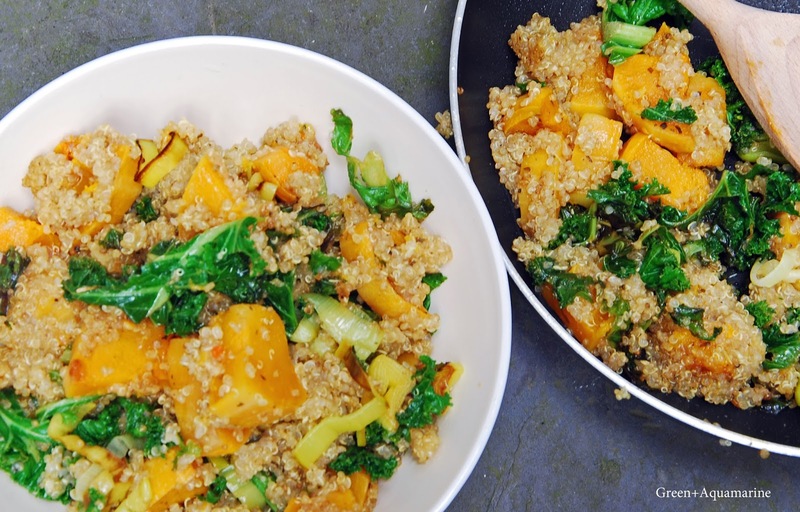 This kale and squash quinoa bowl is a good choice for such moods as grain bowl is reminiscent of porridge, and, with a bit of evening prep, is nice and simple to put together for a weekday early start as it is for Saturday brunch. The lemon brings all the ingredients together without being too heavy. Plus, with only three main ingredients and condiments, my breakfast bowl won’t overwhelm your palette (or washing up load!). The measurements here are approximate, and depending on what size butternut squash you buy, you may find this serves closer to three than two people. If so, pop any leftovers in a Tupperware for a satisfying lunch later on. You can also swap the quinoa for bulgar wheat, which is less expensive, buttery tasting and still a good source of protein. 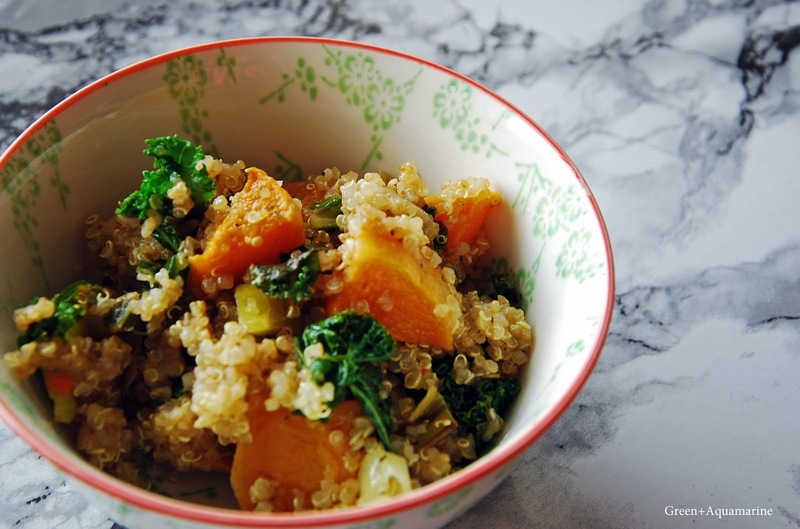 I strongly suggest cooking the butternut squash and quinoa the night before! Preheat the oven to 180 degrees C. Peel, remove the seeds and chop the butternut squash into bitesized cubes. Tip into a roasting tin, and drizzle with olive oil and herbs before roasting in the oven for 40 minutes, checking occasionally. Next, rinse and cook the quinoa in two parts water for every one part quinoa. Add a stock cube, or teaspoon of stock powder and a pinch of pepper or chilli. Cook in a lidded pan for twenty minutes, or according to packet instructions. In a frying pan, saute the kale in a tablespoon of coconut oil over a medium heat until wilted. 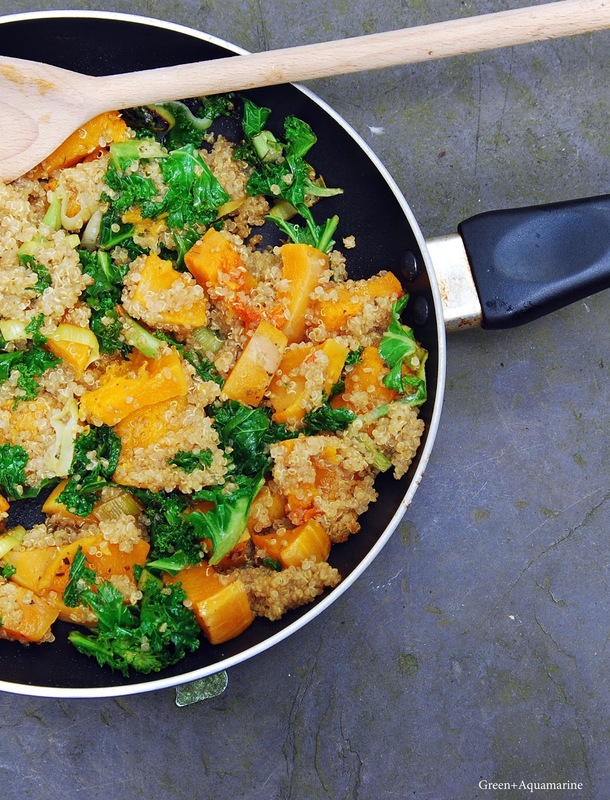 Add the butternut squash and quinoa and stir. Add the juice of half a lemon, and salt and pepper to taste. When everything is heated through, divide between bowls, and enjoy. If you’d like, you could also add goat’s cheese or sliced (or shaved if you’re feeling fancy) avocado. Next Post Fitness Playlist: Pump It!